Hamleys is a shop full of never-ending enjoyment, toys and games. Over four floors discover thousands of fun items, including Hamleys original toys, traditional Czech games and toys, and toys produced by major international brands. The original Hamleys toys include items of wonder for little children, stuffed animals, and remote control toys. Plus there are art supplies, sports equipment, and toys and games to play outdoors. 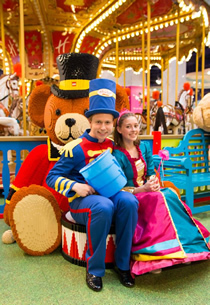 Hamleys has some exciting attractions younger visitors can participate in too. There is a mirror maze to get lost in, mini-racing cars to drive round a circuit, and a carousel replete with gleaming wooden horses and royal carriages to ride on. There are also temporary attractions. Until December 2019 Hamleys has a LEGO exhibition entitled 'Czech Repubrick'. Famous Czech monuments have been constructed in Lego, for example St Vitus Cathedral, Karlstejn Castle, Jested TV Tower, Hluboka Castle and other attractions. And, enjoy the largest LEGO roller coaster. 2.5 tons of LEGO bricks were used in the exhibition, and it took 13,850 hours to build! To participate in any of the attractions visitors will need to purchase a Hamleys Card from the desk at the front of the store.